ARLINGTON, VA — Asking “May I see your ID, please?” isn’t the only step in stopping minors’ attempts to get a vaping product, a tin of smokeless or a pack of cigarettes. In the last 12 months, FDA, which has oversight over tobacco and vapor products, has issued three new guidance statements and conducted more than 132,000 compliance checks. Meanwhile, six states and hundreds of localities have changed laws to raise the age to 21. All of this means retailers need to keep up with their training and push for greater awareness of identifying and denying age-restricted product sales to minors. During We Card Awareness Month in September, the national non-profit training program challenges retailers to step up their game and improve overall store compliance. “Properly “carding” customers is just the first step for a sales associate” according to Doug Anderson, president of the We Card Program. “Examining an ID involves comparing the customer to the ID’s photo and description, checking the expiration date, flipping the ID over to check the bar code and calculating the customer’s age using the ID’s date-of-birth and an age calculation tool,” said Anderson. One missed step during “carding” can result in an illegal sale to a minor. With FDA announcing a nationwide “blitz” of retail compliance inspections in April, and a national spotlight focused on kids’ getting the new vaping products, responsible retailing of age-restricted products is an operational must for retailers. Alabama, Arkansas, California, Colorado, Connecticut, Delaware, Georgia, Idaho, Illinois, Indiana, Iowa, Louisiana, Maine, Massachusetts, Michigan, Minnesota, Mississippi, Missouri, Montana, Nebraska, Nevada, New Hampshire, North Dakota, Ohio, Oklahoma, Oregon, Pennsylvania, Rhode Island, South Carolina, South Dakota, Tennessee, Texas, Utah, Virginia and Washington. Many more are anticipated throughout September. “During We Card’s 23 years of training and education, we have witnessed a national decline in youth access violation rates from 40% to about 10%. Any underage sale is unacceptable, and that’s why keeping awareness up is important,” said Lyle Beckwith, Senior Vice President of Government Relations for the National Association of Convenience Stores and a We Card board member. NACS is a founding board member of We Card. “Every minor today grew up seeing ‘We Card’ in stores. The program trained retailers to deny e-cigarette sales to minors before half of the states and the FDA regulated them years ago. Preventing age-restricted product sales to minors is a top priority for convenience stores and why our support as a founding member in 1995 continues to this day,” said Beckwith. 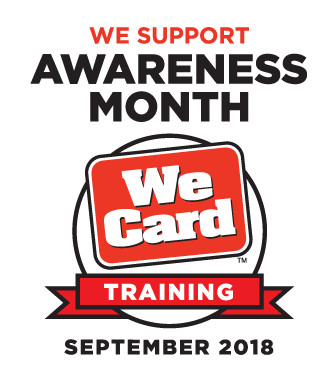 September’s We Card Awareness Month marks We Card’s availability of its 2019 in-store materials – where retailers order next year’s training and education We Card Kits and Age-of-Purchase Calendars – a daily reminder age calculation tool. Training store employees, especially new hires, is the core of We Card’s comprehensive program for retailers. The award-winning training includes FDA requirements of retailers, and regulations’ summaries as well as state-specific law training, interactive exercises, practice at examining IDs, calculating customer’s ages with a variety of age calculation tools and customer service tips for denying sales to minors. We Card’s training meets and exceeds FDA’s recently updated (August 2018) Guidance for Tobacco Retailer Training Programs. About We Card: The We Card Program, Inc. is a national non-profit organization that represents a unified effort among trade associations, retailers, wholesalers and manufacturers. It was created 23 years ago to support retailers of tobacco and other age-restricted products. Individual retail establishments as well as large retail chains use We Card's educational and training services to comply with federal and state laws while working to prevent underage tobacco, e-vapor and other age-restricted product sales. National and state retail trade associations, government officials, community groups and others also support We Card's ongoing efforts to educate and train retailers.